BASKETBALL SPOTLIGHT NEWS: Elliot Cadeau Looking To Make National Statement! 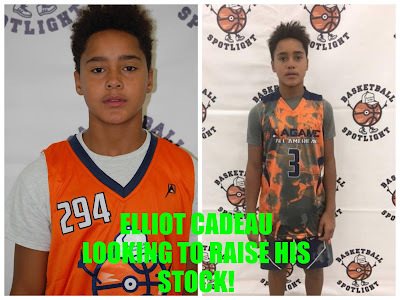 Last summer Elliot Cadeau cracked the Top 10 at the Future Phenom Camp. The point guard also made an appearance in the AGame All American Game. He kept his hot play going during the Basketball Circuit with Sports U. Now he’s returning to the Future Phenom Camp to show he’s one of the top guards in America. The stage will be bright in Boyd’s, MD as the top players in America will be attending. Stay tuned as we bring your more top players that will be heading to the Future Phenom Camp.